We are known in the industry as the ‘go to’ guys, a reputation earned by tackling jobs that all of our competitors have turned away. From complex projects that require finesse and intricate details to those that demand high power…we live up to the name Precision on every job. At Precision Waterjet & Laser, we have built a reputation as a trusted supplier of end to end manufacturing solutions to customers across a wide range of demanding industries. Our flexibility and vast resources allow us to take on projects that many of our competitors will not even quote. When precision CNC machining is required, we can call on our extensive in-house machining capabilities that allow us to provide exceptional value and quality even for the most complex work. We are equipped with a number of advanced machining systems, including precision CNC lathes and mills from Haas. Our Haas equipment represents the cutting edge of machining technology, and includes five vertical mills, one horizontal mill, and a precision lathe. These systems provide a work envelope of up to 64″ x 32″ x 30″ for milling and 16″ in length and 23″ in diameter for turning. In the hands of our team of seasoned machinists, we can achieve tolerances of ±0.0005″ for straightness, concentricity, and diameter, as well as ±0.001″ on lengths over 24″. We can machine virtually any ferrous and non-ferrous material, from aluminum, steel, and brass to super hard specialty alloys, exotics, and precious metals. This is in addition to a wide range of plastic polymers, and not so common materials that include glass, ceramics, quartz, composites, even wood. When this is combined with the design and fabrication of all tooling and fixtures in-house, and a 10,000 lb. lifting capacity, our advantages become clear. All of these capabilities and resources are backed up by a robust quality program that is built on our ISO 9001:2008 and AS 9001 certifications. For more information or to talk to us about your next project, contact us directly. As our name implies, at Precision Waterjet & Laser we specialize in laser cutting, which is a main component of our total manufacturing capabilities. Laser cutting offers a number of advantages and is ideally suited for low to high volume production with tight tolerance requirements. Our facility is equipped with three advanced laser cutting systems that give us a high level of process flexibility and production capacity. These are high powered CO2 lasers that utilize 4400 kW of power and features such as flying optics and the ability to cut at 2, 3, and 5 axis. They can accommodate workpieces up to 80″ x 160″, and diameters up to 80″. Through tight control of speed and power, we can achieve tolerances of ±0.002″ on everything from the thinnest sheet metal up to material that are 1″ in thickness. This applies to ferrous and non-ferrous metals, including aluminum, Monel, Inconel®, various types of steel and stainless steel, in forms that include heavy plate, pipe, and virtually any form that can fit our work envelope. 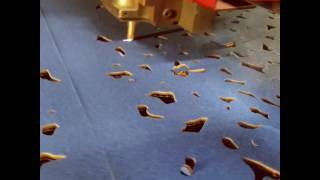 However, laser cutting is not limited to metals only; we regularly work with non-metals like ceramic, acrylic, rubber, plastic, wood, paperboard, and paper. As a forward thinking manufacturer, our facility and entire team is geared for efficiency, we are committed to the tenants of Lean Manufacturing and continuous improvement. We hold ISO 9001:2008, and AS 9100 certification, and employ a level of automation that allows us to operate lights out. The combination of these resources and capabilities allows us to offer lead times of one to six days, as well as rush and emergency services. To learn more about this and all of our fabrication services, contact us directly. 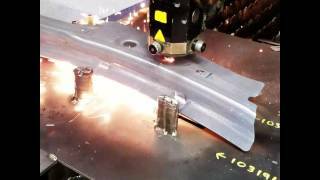 When it comes to sheet metal fabrication, our team at Precision Waterjet & Laser is equipped with the tools and experience to accommodate almost any sheet metal fabrication project. Through our years of experience as a contract manufacturer, we have helped customers across a broad range of industries to drive down cost and drive up quality. In addition to waterjet and laser cutting we also provide design and consulting services, and operate a fully equipped machine shop, that can provide rapid prototyping to help streamline R&D projects as well as large-scale orders. Fabrication processes we provide include metal stamping, punching, forming, bending, or any method necessary to meet your design criteria. Our staff includes skilled fabricators, and AWS certified welders, who deliver a level of craftsmanship that eclipses industry standards for quality and integrity. We can also facilitate a full range of finishing options; these include anodizing, plating, painting, and much more. From aerospace applications to building products, we’ve applied time tested manufacturing techniques and cutting edge equipment to increase the value of every product we manufacture. For our staff, quality is more than a process requirement, its part of our culture and pervades every area of our organization. We hold ISO 9001:2008 and AS 9100 certifications, and can provide compliance with various Mil-specs and other industry standards and regulations. To learn more about the advantages of working with an industry leader, contact us directly. With 5,000 to 92,000 PSI of pressure they deliver cutting speeds of up to 600″ per minute, depending on material thickness and type. 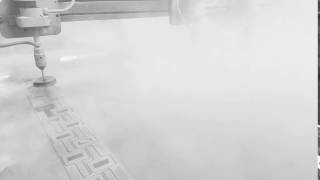 Our waterjets are also equipped with a level of automation that allows us to run light out. Efficiency is further enhanced with kerf widths as small as 0.005″. When this factor is combined with advanced nesting software, material usage is maximized, lowering overall costs even further. 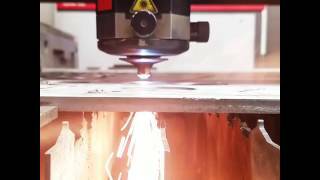 Waterjet cutting as a process offers a number of advantages that heat or friction based methods cannot match. It inherently provides minimal part stress, there is no thermal distortion or the material hardening that is normally associated with flame cutting, producing clean smooth edges that require little or no secondary finishing. 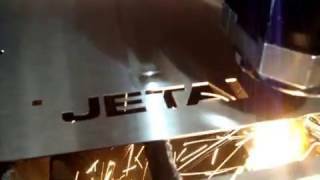 For more information, or to learn more about the advantages of waterjet cutting, contact us directly. Laser cutting 304 stainless with #4 finish. Laser cutting 1/8" wall aluminum tubing. 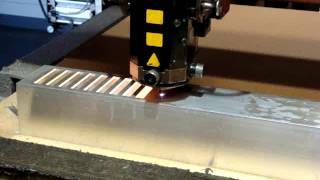 5 axis waterjet cutting a bevel on aluminum tooling plate. Turning parts on our Haas lathe. A sample of a stainless steel part we laser cut, brushed and then formed. 4 head waterjet cutting machining blanks. 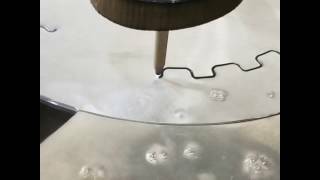 Deburring aluminum parts on our rotary timesaver. We combine the latest, state-of-the-art cutting technology, decades of manufacturing experience, and a dedicated team of professionals into an extraordinary facility with one goal in mind: to exceed your expectations for quality and customer service. No two days at Precision Waterjet are ever the same in a typical shift, we might put the finishing touches on a dance floor for a Las Vegas casino, create explosion-proof panels for an airline security company, or produce material for a highly tuned piece of equipment for a medical lab. Check out these military parts we just wrapped up. Laser cut 14 gage steel. Laser cutting a unique design in felt fabric. 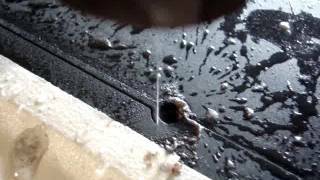 Pure waterjet cutting a custom gasket from neoprene rubber. 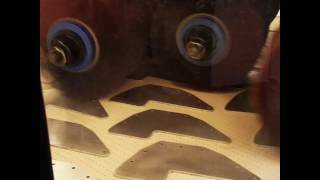 Laser cutting a plate of 304 stainless steel exhaust flanges. 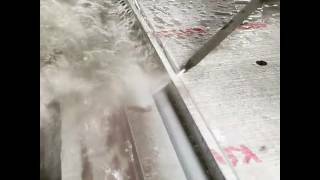 Waterjet cutting through 1/2" 304 stainless steel plate. 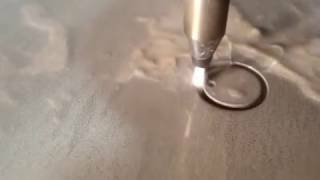 Trimming an automotive part on the laser. We offer additional value-added services that include welding, forming, machining, painting and plating, hardware installation, deburring, and even supplying material. This makes us the one-stop shop that saves you time and money. 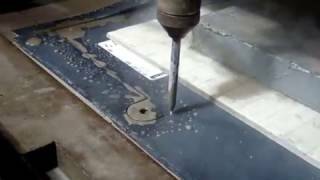 Waterjet cutting a rotor blank. We are known in the industry as the "go to" guys, a reputation earned by tackling jobs that all of our competitors have turned away. From complex projects that require finesse and intricate details to those that demand high power we live up to the name precision on every job. 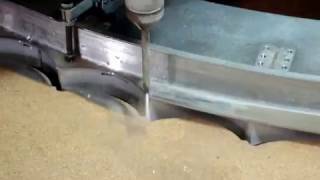 Demonstration of waterjet trimming a pre-machined inconnel ring.